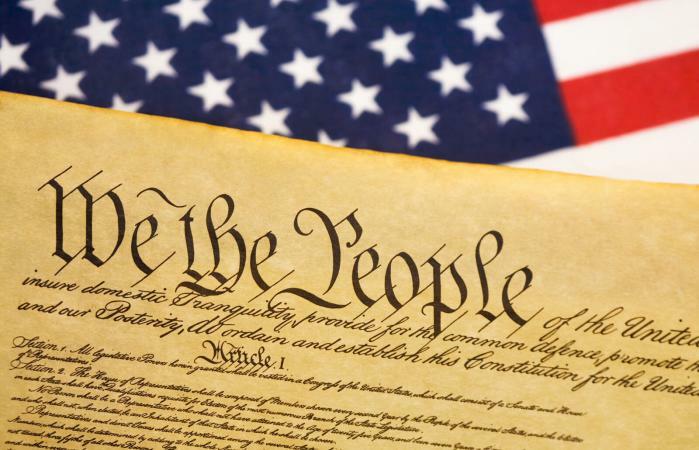 U.S. Constitution facts for kids make learning about the United States government easy and fun. Kids of all ages can find out why the Constitution was created, who helped create it, and why it's still used more than 200 years later. When teaching kids about the U.S. Constitution, it's important to start with what the document is and what it does. Use images of the document or an online version of the Constitution to show kids exactly what it looks like. The United States of America's first Constitution was called The Articles of Confederation. All government powers come from the Constitution. Preamble is the name given to the introduction section of the document. The rest of the original Constitution includes 7 Articles. It wasn't until 1791 that the Bill of Rights was added to the document. The Bill of Rights is based on four different historical writings including the Virginia Declaration of Rights and the Magna Carta. The original U.S. Constitution was made of four pages, each about 28 by 25 inches. Throughout history there has been some debate about who was involved in creating the Constitution because the specifics weren't always clearly documented. Today the U.S. National Archives gives solid answers on which men were present and what they did. In May 1787 delegates from 12 states met in Philadelphia to redesign the U.S. government. It took less than 100 working days to create the Constitution. Gouverneur Morris, a representative from Pennsylvania, is largely responsible for the language used in the Constitution. Pennsylvania State Assembly Assistant Clerk Jacob Shallus is believed to be the man who actually penned the Constitution that was signed. At first, large and small states couldn't agree on whether the population of a state should determine their number of votes. The Great Compromise, or Connecticut Compromise, is the plan where states agreed the House of Representatives members would be determined by population and the Senate would represent each state equally. On September 17, 1787 thirty-nine out of fifty-five delegates signed the U.S. Constitution. According to The White House, the Constitution "protects the fundamental rights of United States citizens." This special document changes with the times, which is why it's sometimes called a living document. Pennsylvania State House, the same place where the Declaration of Independence was written, was also where the Constitution was written. Delaware was the first state to agree to the Constitution, Rhode Island was the last. It takes about half an hour to read the current version of the Constitution. After many states agreed to use the Constitution, it was set to be used starting on March 9, 1789. The Constitution has been changed, or amended, 27 times since it was first accepted. Amendments to the Constitution are made to include new rights such as the 13th which outlawed slavery and the 19th which gave women the right to vote. To propose an amendment there must be either a two-thirds vote from Congress or a constitutional convention called for by two-thirds of U.S. state legislatures. Three-fourths of U.S. States must agree to an amendment before it can be added to the Constitution. Constitution Day is celebrated on September 17 to commemorate the day it was completed and signed. More than two decades ago a bunch of men gathered for months to write this historic document in secret. Thanks to their mysterious ways, there are lots of weird facts about the Constitution. The youngest member of the Constitutional Convention was 26-year-old Jonathan Dayton. At age 88, Benjamin Franklin was the oldest member of the Constitutional Convention. James Madison kept a journal during the Constitutional Convention and it sold to President Jackson in 1837 for $30,000. From 1804 to 1965 there were no amendments to the Constitution making it the longest period without one. The U.S. Constitution is the oldest written national Constitution that's still being used. The guys who created the Constitution are called "Framers." The President of the United States does not play a role in amending the Constitution. Kids who are just learning about the U.S. government and older kids working on projects can benefit from fast facts. Get creative with your presentation of facts and keep them age-appropriate to get the most use out of them. Use Constitution facts to create a U.S. Constitution quiz and test kids' knowledge. Turn facts into critical thinking questions or journaling questions. For example, you might ask "The creators of the Constitution were called Framers, what would you have called them and why?" Write a fact on the board during each lesson at school and ask kids to guess whether it's true or false. Challenge older kids to a research scavenger hunt to see if they can find more Constitution facts that aren't listed here. Use the facts to re-enact the Constitutional Convention. Constitution facts provide kids with a snapshot of what the United States government is all about and how it was set up. If you want to learn even more about this important historical document you can find books and documentaries that go further in-depth about it.